Brooklyn Heights | Custom & Private New York Tours, Inc. Via the Brooklyn Bridge, ten minutes from Manhattan; it’s American’s first suburb, first landmark neighborhood with over 600 brownstones and town homes built before the Civil War. “The Heights” was home to Arthur Miller, Walt Whitman, and birthplace of Churchill’s mother. The views of Manhattan are breathtaking. Let’s check out nearby Williamsburg, Grand Army Plaza and DUMBO (Down under Manhattan Bridge Overpass). Please don’t pass this up! It’s our favorite and most beautiful neighborhood. Find out why it became America’s first suburb. 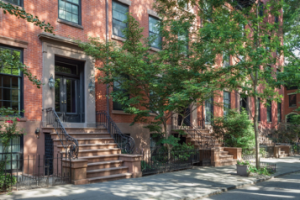 Have you ever seen a $16 million brownstone town-home?